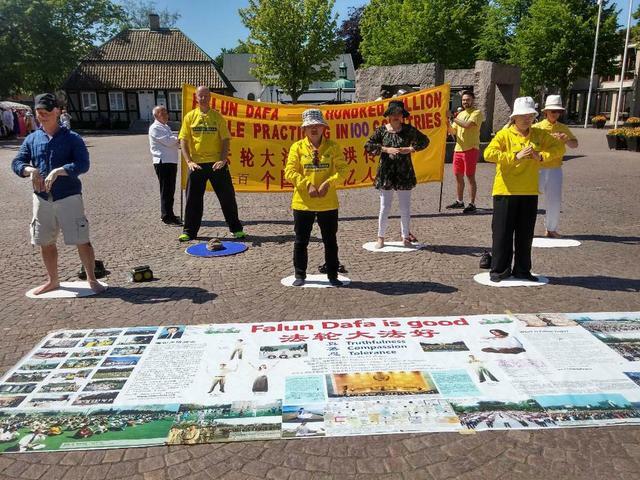 Falun Gong practitioners in Sweden introduced this traditional cultivation practice in Angelholm, a famous tourist town known for its long sandy beach, on May 27, 2017. 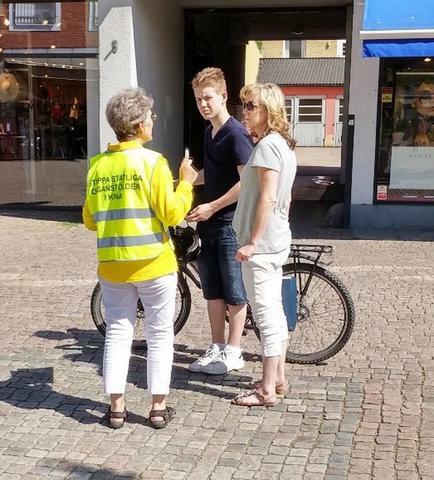 On this sunny day, the practitioners demonstrated the exercises, distributed introductory flyers, told people about the persecution of Falun Gong in China, and collected signatures on a petition calling for an end to the Chinese Communist Party's (CCP) forced organ harvesting from living practitioners. It was the first time many local residents had ever heard about Falun Gong. They gathered around to watch the exercise demonstration and read the literature. A lady stopped on her way to the bus station and said, “This is what I need. It's beyond yoga.” She read the flyer and took a copy of the exercise schedule with her. A Chinese Swede told a practitioner that he had lived in Sweden for more than 30 years. With a smile on his face, he listened to the practitioner's introduction and started to learn the exercises there and then. Dressed in yellow T-shirts and holding a big sign, several practitioners collected signatures to protest the CCP's forced organ harvesting on a nearby street. Many passersby stopped to sign. 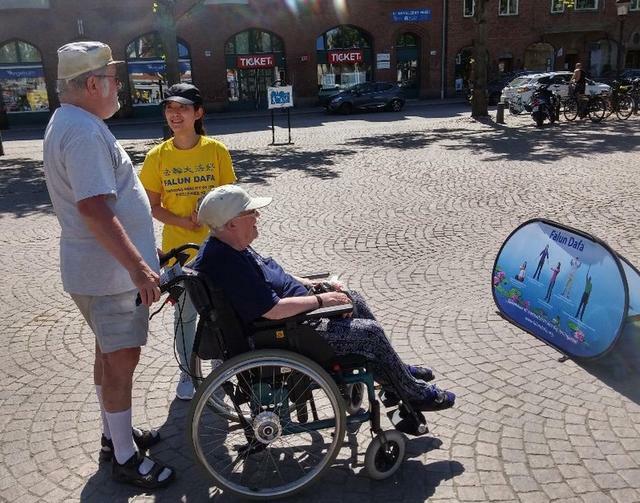 A man bought his friend over and asked, “Would you please tell my friend about Falun Gong?” The man himself had learned the facts about Falun Gong when he was in Copenhagen and Helsingborg, but his friend had never heard about it. After listening to the practitioner's introduction, his friend was saddened to learn of the forced organ harvesting and signed the petition without hesitation. They talked with the practitioner for a long time and became interested in learning the practice.